...that the manned mission to Mars where humanity first came into contact with the Traveler was called Ares One? Shriekers are a class of Hive, possessing a metallic body containing an energy core inside. These ever-watchful sentinels are believed, in some circles, to serve as the eyes of the Hive's innermost covens, allowing powerful Wizards and Knights to watch over their domains. Others believe Shriekers are nothing more than weapons meant to guard Hive ritual sites. There is nothing living to the Shrieker, but neither are they mechanical constructs in a classical sense. They seem to be dead mass, animated by the arcane will of the Hive. When a Shrieker is broken, its Void charge rips free of the hull to seek vengeance. Closed Shriekers are impervious to attack, so one must approach a Shrieker to open it; once provoked it will split into multiple pieces that float around a core. When attacking it will periodically shoot a cluster of many simultaneous projectiles at the player until killed. 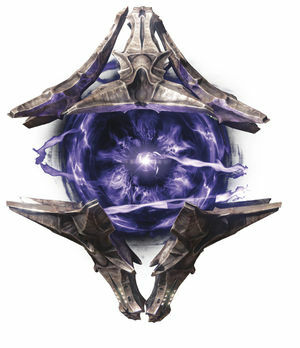 When destroyed it will release a final swarm of its explosive projectiles which will then track towards the Guardian that defeated it, making it deadly even in death. However, Sleeper Simulant can destroy a closed Shrieker. Shriekers follow a new attack pattern, now firing a continuous spiraling stream of projectiles capable of rapidly shredding the player's health. The old cluster attack remains, but is used only occasionally.